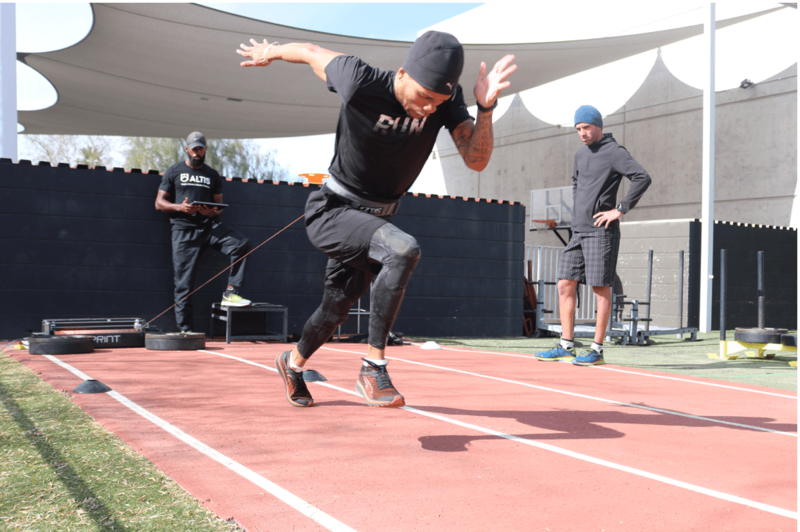 Written by ALTIS Speed & Power Coach – Jason Hettler – this article explores the use of resisted sprint training for speed development. Traditional views on speed development are often rooted in maximum strength. It is frequently believed, and sometimes correctly so, that increasing maximum strength abilities will result in a subsequent increase in speed. While this may hold true at developmental levels, the landscape in elite settings is a bit trickier to navigate. Research coming from Morin et al. (2011) and Rabita et al. (2015) has suggested that sprint performance, particularly throughout acceleration, is determined more so by the orientation of force application rather than the magnitude of force generated. More specifically, horizontal force application and the sustainment of such through increasing velocities appears to be a separating factor between elite and sub-elite sprint performances. The question then becomes, “How best do we train this ability?”. This is where heavy resisted sprint training comes in. Heavy resisted sprint training has been a hot topic of discussion lately. Spearheaded by research from the likes of Morin, Clark, Samozino, Petrakos, Cross and others, as well as case studies presented by Cameron Josse and Bob Thurnhoffer, the effectiveness of traditional loading of 10-20% bodyweight is being questioned. Some suggest that loading upwards of 100% bodyweight may be the answer for the training of effective force abilities (ie. the appropriate magnitude and direction of application in the appropriate timeframe). And we just so happen to have one at ALTIS. 1080 Sprint is a portable resistance training and testing device for sprints, skating, swimming and change of direction movements. In an ongoing series of articles and case studies we will keep any interested parties up to date on the utilization of such a powerful machine with a group of elite track and field athletes. “There are many limitations to the traditional scientific model and its application to the elite sport environment. Traditional science is built on ‘generalizations’ that are developed from a sample of a population who are often ‘typical’, not ‘outliers’. Oftentimes, the fruits of traditionally conducted scientific labor have little relevance for elite athletes and elite sport practitioners. What works for the average is often not that helpful because elite athletes are not average. Too often scientific discovery is a self-replicating system that rewards the controlled, lab-based, relative simplicity of traditional research, rather than engaging in real-world, sport-specific explorative inquiry, where research is embedded into the training environment. The bottom line is that effective integration of science with practice in elite sport requires novel solutions to address these challenges. The living laboratory is one such approach. It is a non-traditional form of scientific inquiry. Here the natural environment is the laboratory. The laboratory comes to the participants being studied, not the other way around. The practicality and functionality of the 1080 Sprint, combined with its measurement abilities make it a clear candidate to incorporate into the Living Lab framework. From there we begin the on-boarding process. This topic of discussion often gets lost when discussing sports science and bringing in new technology but is an important piece of the puzzle. The first task was to gain a high-level understanding of operational procedures to ensure seamless integration into the daily training environment. Fortunately, the user-friendly nature of the machine combined with the customer service from those at 1080 made this first step easy to conquer. 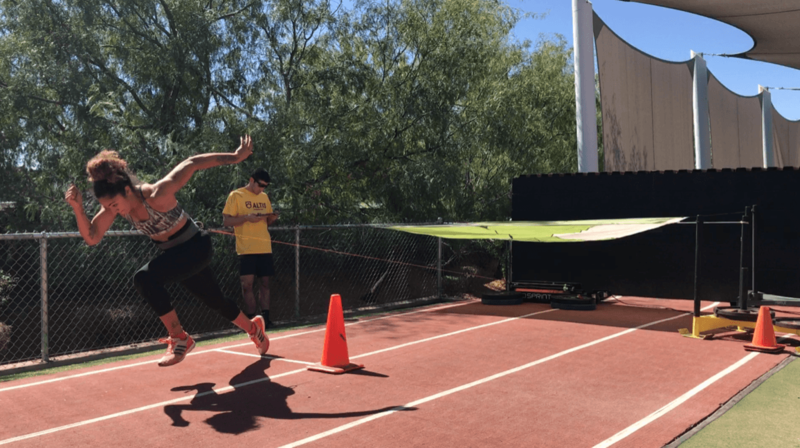 The next step was to safeguard against any negative kinematic transference – a popular argument from skeptics of heavy resisted sprint training. While this is an understandable argument, I believe it can be sidestepped via appropriate implementation. For instance, thus far we have not exceeded 6 repetitions at loads greater than 50%BW in any given week for any athlete. To put this in context, this is roughly 10% of the total accelerations performed in a week. In my opinion, this is not nearly a high enough percentage to carry with it any negative kinematic transference, particularly with an athlete population that carries such a high training age. Step three was, and still is, less easy to define. Resisted sprinting has been a part of our programming for quite a while but we now have found ourselves in a position to do so much more. Namely, we suddenly had greater control over the type and magnitude of resistance with the ability to capture data around power, force, speed, and acceleration. It has been this data collection and analysis, that has had a slow progression. In the ALTIS Foundation Course, Stuart McMillan discusses how the process of categorization can, “add meaning while reducing complexity”. In data collection and analysis, the distinction between that which is exploratory in nature versus explanatory has been helpful in this process. I first came across this categorization in Storytelling with Data by Cole Nussbaumer Knaflic and it has elicited a sense of patience. The allure of such a powerful machine with such an elite group of sprinters brought about an eagerness to jump into explanatory analysis directed at telling a specific story. However, it is now easy to see that an undefined period of time needs to be earmarked for exploratory analysis. We need to let the story come to us. Although Nussbaumer Knaflic discusses the difficulties of telling stories using exploratory analysis and advises against it, throughout this series I will attempt to communicate our journey. If we get lucky, maybe we will stumble across some explanatory destinations along the way! Morin JB, Edouard P, Samozino P. Technical ability of force application as a determinant factor of sprint performance. Med Sci Sport Exerc. 2011;43(9):1680-1688. doi:10.1249/MSS.0b013e318216ea37. Rabita G, Dorel S, Slawinski J, et al. Sprint mechanics in world-class athletes: A new insight into the limits of human locomotion. Scand J Med Sci Sport. 2015;25(5):583- 594. doi:10.1111/sms.12389.